Hmmm So You THINK You Found A Better Deal? I hear it all the time "Your Trikes Are So expensive, you must be making a killing!!" If you analyse what actually makes up a Lovett Industries "FAT DRIFTER" you will see there is a hell of a lot of work that goes into these trikes the from the Fully TIG welded frame to the amazing powder coated finishes all the way down to the billet Foot Rests and custom moulded seat. So you think you can make it cheaper? well you probably can we dont run our business like a "Red Cross soup kitchen" giving everyone "FAT DRIFTER'S" at material ONLY cost would just be silly. "But I Found One Cheaper that looks EXACTLY the same?" The reality is there are plenty of Motorised Big Wheel Drift Trike's out there that may appear to be similar looking BUT Lovett Industries are the Pioneers of Motorised Big Wheels in Australia, all the trikes we sell are backed by us and we have heaps of customers all over Australia that keep coming back to us because WE ARE THE BEST!!! IF you can even source all those parts please tell me what costing you come up with, ALSO remember we are a business and need to make profit otherwise what is the point of selling trikes? We are not a charity and if you can make the trikes cheaper that is great go and give it a crack. With a Big wheel that weighs 63kg's the components we were originally using were from "FAT BIKES" we would basically rob the complete front end from a bike and custom fab a frame to suit. These components were only ever designed for "BICYCLES" not for use with a Motorised Big Wheel. The main "FORK STEERER" tube is only 1-1.5mm thick this is all good for a bike that weighs 10-15kgs. But when using these forks on a Motorised Big Wheel, there are more forces applied that affect strength and structure of the standard "FAT BIKE" Fork. We learnt some Hard lessons at the start and we have totally changed the way our "Motorised Big Wheel Drift Trike's" are made. Our current range of "Big Wheel Trike's" has a totally custom designed fork, the "FORK STEERER" is made from Solid Round Bar, so there is NO way these bad boys will be breaking anytime soon!!! So NEXT time you see another "Big Wheel" that is cheaper than ours, ask yourself, Do i really want something that will eventually fatigue and SNAP? Here is a 2 simple questions that you SHOULD ask when purchasing a "Big Wheel Drift Trike"
1. Do you use standard "Fat Bike" Forks or are your forks "Custom"
If they answer "YES" to any of these questions, one would suggest to give it a miss. SNOT!!! THAT BACKYARD BUILDERS USE!!! Lovett Industries and Motorized Drift Trikes Who and What Are they? It all started in late 2014, i was on my local FB buy and sell page “Bidding Wars Bunbury” just skipping through looking at what everyone was selling, my eye was fixated on this thing, i had never seen anything like it before but i was curious to know more. I was working offshore at the time and contacted the seller, we struck a deal and the “Motorized Big Wheel Drift Trike” was ALL mine. I couldn't wait to get home and give it a crack. When i first saw this Motorized Drift Trike in the flesh i was like “Hell Yeah, this looks sick as!! 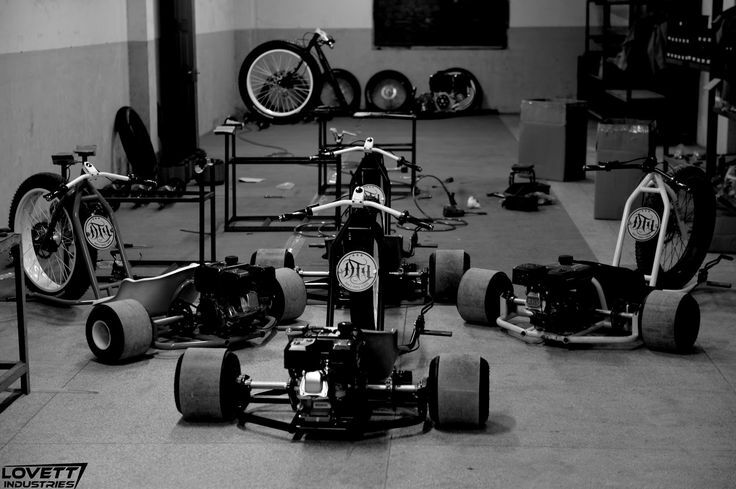 !” I fired the Motorised Big Wheel Drift Trike up and took it for a spin……WOW! i was hooked, sliding around corners just inches off the ground, executing 360’s but only getting to 180 degrees LOL. The feeling was surreal and it was like a drug , I just had to have more. So i began manufacturing "Custom 1 OFF” Motorized Big Wheel Drift Trikes, I have a Mechanical Background as a Diesel Mechanic and also am pretty good with a TIG Welder. My wife was head of the design team and came up with some funky designs for me to fabricate. After getting swamped with orders at Collie Gazzanats 2015, we decided get cracking with our custom 1 off designs. We now have an Online Store www.lovettindustries.com.au and we sell our Current range of Motorized Big Wheel Drift Trikes , All over Australia from Darwin to Tasmania and everywhere in between. So If you're looking for a REAL Motorized Big Wheel Drift Trike, that goes harder than the rest, looks 110% better and is very reasonably priced, then you have found the RIGHT place, we offer our "Motorized Big Wheel Drift Trikes" at an awesome price and you can be assured that we will provided support to all our Past Present and Future customers. Ebony and Ivory Who Doesn't LOVETT? Hmmm, yes well we all love a little bit of Old School Flavour Right!!! Apart from Selling the Best Motorized Big Wheel Drift Trikes in Australia, we also love to look at photos, i mean who doesn't. We have some awesome photos here to show you just click on our "Eye Kandy" Link on our main menu and have a look at the awesome photos we have compiled thus far. Are you too old for a Motorized Big Wheel Drift Trike? "FAT DRIFTERS" as you know there are quite a few "Backyard" Jobbies getting around building custom Motorized Big Wheel Drift Trike's etc, i just want everyone to know when you buy from Lovett Industries, not only are purchasing an amazing Motorized Big Wheel Drift Trike that has had the engineering mastered and fully TIG welded frame, you are actually buying your youth back again.....Hows this you say? Provide Awesome products to our customers that bring back their youthful flair. So if your wondering should i give it a go Umm hell yeah!!! does a Bear...... in the woods? The answer is YES!!! Take advantage of out Intro Promo offer of $2500 because once the Promo is over there is no telling when the prices will drop again.